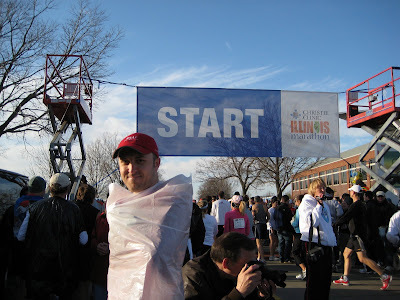 Way back whenever it was that I first heard about the Illinois Marathon, I distinctly remember that I was so excited, I couldn’t sleep at all that night. It was a dream come true. After almost 8 years of running marathons, there was finally going to be one in my own hometown. Then when I saw a map of the course, it was if I had died and gone to heaven. Just about every square inch of the course was on streets I have run on hundreds of times. I couldn’t wait. Then a couple of things happened. I ran the Indianapolis Marathon in October and ended up qualifying for Boston. The Boston Marathon would be just a couple of weeks after the Illinois Marathon, which created a dilemma. Some of the more hard-core ultra runners from the club are capable of back-to-back marathons like that, but from personal experience, I know that I need to take it very easy after a marathon or else I end up with an injury. So if I was going to run Boston, that meant I couldn’t run Illinois. Sure, people had suggested just “running easy” at Illinois to conserve myself for Boston, but I don’t care how slow you go, running a marathon is never easy. 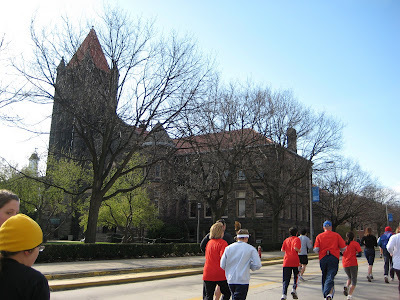 There would be the option to run the Half Marathon at Illinois, but that just seemed kind of pale in comparison. 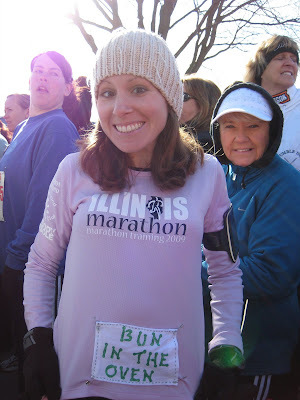 It might sound like crazy to people who have worked hard to BQ, but in many ways, I was inclined to forego Boston in favor of the Illinois Marathon. It all turned out to be a moot point anyway. By December, I found out I was pregnant with Fig, and while anyone else in my situation would have been thinking about decorating a nursery or how to negotiate maternity leave, I was thinking about what this meant for the marathon. “You can always run it next year,” is what everybody said to me, but it really only made me want to strangle them. At my first pre-natal appointment, when I was under-weight, dehydrated, and barely able to hold my head up from the puke bucket, I asked my midwife about running the marathon in April. She actually laughed. In all honesty, I was much more disappointed about missing the Illinois Marathon than Boston. I still held out that I could try for the half, but the unrelenting nausea and vomiting, coupled with sudden onset knee pain (related to pregnancy or not?) put a damper on those dreams. In desperation one night, I finally signed up for the 5K, but I actually cried while I did it. It felt like my first act of lameness. The first tangible incident in which I had lost myself forever and I would become this mini-van driving mom-bus with bad hair and a “my kid is on the honor roll” bumper sticker, and I would never, ever be my own person again. Over the winter, I lost count of how many ultramarathons, other races, and training runs Rob did, while I stayed at home throwing up. Whenever I got an email update from the Illinois Marathon Training Group I was supposed to be in, I deleted it without reading. It was like pouring salt into an open wound. And then all of a sudden April 11 was here—that long anticipated day I was going to have to sit out of. Even though I had signed up for the 5K, I wasn’t sure I could do it. I hadn’t been able to run more than 1 mile continuously since mid-December, whether it was because of pain in one or both knees or because the persistent nausea kept me feeling too sick. The day before the race, I biked over to the expo to get my race number, and that’s when it hit me. This was a real marathon going on here. Not some thrown together fun-run that a dozen or so people from the club had put together. It was real, official, planned, and meticulously organized. When I walked into the expo and saw the huge room filled with booths, vendors, music, and fanfare, I started bawling. Sometimes having a sense of purpose makes you feel better, so I threw myself into planning the route I would follow to bike around the course and cheer Rob on throughout the race. But still. I couldn’t sleep at all the night before the race, not because I was too excited (like I would have been if I were running it), but because I felt too wretched and sorry for myself. I wondered how I was going to stand there and cheer for Rob when all I wanted to do was curl up and cry. On race morning we got up bright and early. Rob had decided to drive over to the start (which turned out to be a very good decision), but I rode my bike, so that I’d have it after the 5K to follow Rob around. Biking over in the cold, fresh air did me good, I think, because I felt a little better by the time I got there. I saw Rob off at the start and then somehow in the mass of people, I found my friends Aimee and Renee. 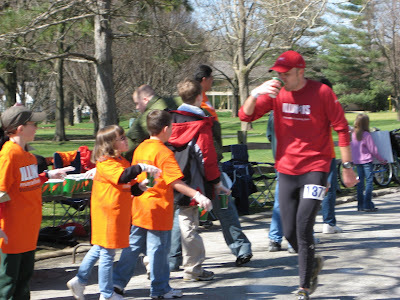 They were also running the 5K and planned on finishing in around 30 minutes. I wasn’t sure if I would be able to stay with them on account of my knees, but I wanted to try to for as long as I could. The 5K was supposed to start 15 minutes after the marathon, but it got more and more delayed. Finally we were off and running. I was surprised that the instinct was still in me. I was running and it felt like I was flying! 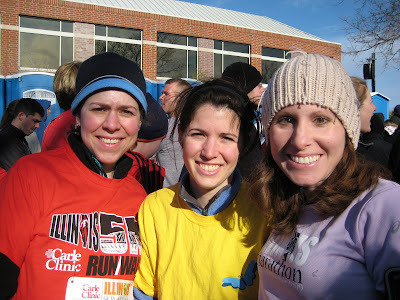 With Renee and Aimee running beside me, my knees didn’t even hurt. When we got to the mile 1 marker, I was surprised to see that our pace was a bit quicker than 10 minutes, and we even sped up through the rest of the race. 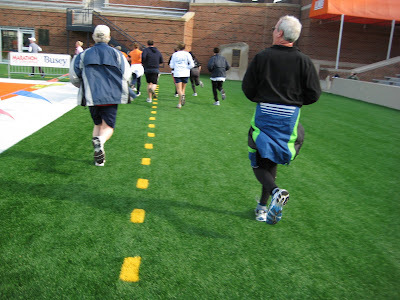 Before I knew it we entered Memorial Stadium and ran on the Astroturf to the finish line. I was really proud of me and Fig for making it all the way to the end and for doing a pretty good job too. We finished in something like 28:12; I couldn’t have done it without Aimee and Renee. Someday, I will have to tell Fig about his/her first race. 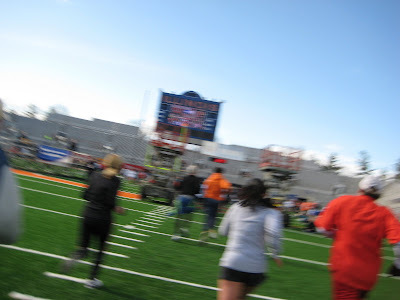 It was hard to take a good picture of the finish line while I was running! There wasn’t much time to bask in the glow of finishing my first 5K with Fig. I eventually found my way out of the stadium and headed back to my bike as quickly as I could (which as it turned out, was by running). Unfortunately, the start of the 5K had been so delayed that I knew there would be very little chance of making it up to West Side Park in time to see Rob pass by at mile 11. I headed up there anyway so that I could meet up with some of the Anthro people, who had set up a cheering station in that area. It was a lot harder to get there than I had thought it would be. There was no way for me to reach West Side Park without actually crossing the course. With something like 9,500 participants, it was a solid wall of runners that I thought I would never get through. Finally, there was enough of a break that I dashed across the road and pedaled like mad to make it to my first check point. In addition to some Anthro friends, Rob’s dad and Cousin Kevin were there, too. They reported that Rob had been past about 15 minutes before I got there—which put him right on his target pace for a 3:05 marathon. Cousin Kevin (also on bike) and I decided to head South to my next checkpoint—around Mile 19.5 on John Street. 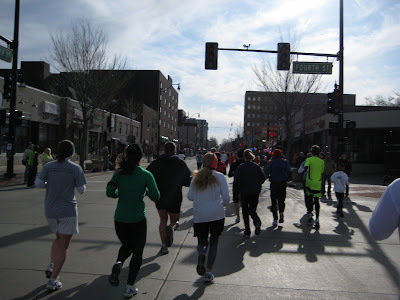 Again, we had some difficulty getting there, as we found ourselves immobilized by a solid wall of runners. Eventually we were able to cross the course and start heading South, but we changed up our plans a little bit and ended up waiting at Mile 21 instead because it was easier to get there. I let a bunch of friends know where we were, and as we waited for Rob’s arrival, we built up quite a cheering section for him. Rob didn’t arrive quite when I expected him to, and after several minutes went by, I began to feel very nervous because I knew this didn’t bode well. 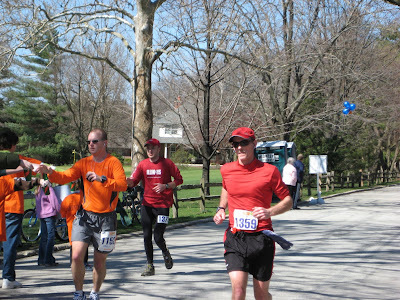 We spotted Rob just after the 3:10 pace group went by, which meant that he had slowed down a bit. As soon as I saw his face, I could tell how bad he felt, and my heart sank. I ran alongside him for a little while and tried to cheer him on, but he just seemed so desolate. He stripped off his long-sleeve shirt and handed it to me without saying a word. 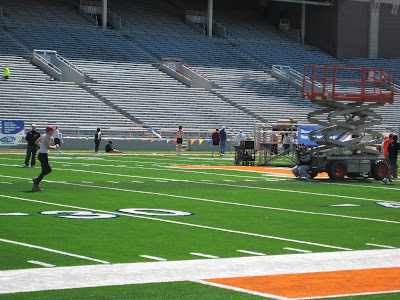 I hopped on my bike and headed back to the finish line at Memorial Stadium. I saw Rob once more, at what would have been around Mile 23.5 for him, and I tried to convince myself that he looked like he felt better. Finally, I made it back to the stadium. There was a mass of people in the stands and it was so hard to see anything. 3:10 went by and no Rob. 3:15 went by and no Rob. Then 3:20 went by. I felt sick inside, knowing that Rob must have been in serious trouble. At last he entered the stadium and crossed the finish line in 3:22:15. That is a truly fantastic marathon time, but I knew that Rob would be disappointed in himself. He was pretty beat up after having hit the wall shortly after the halfway point and struggling through excruciating quad pain for the remainder of the race. I ran to get our car in the parking lot and bring it as close as I could to the finish line (which wasn’t really that close). I drove him back to our house so he could get a warm shower and some food, and luckily, Rob’s parents took me back to pick up my bike. In retrospect, I wish I would have done things differently. I wish that I hadn’t been so sick all winter, so that I could have been fixing healthy meals to fuel Rob through his training. I wish that I wouldn’t have encountered so many problems along the course and been able to see him more frequently. Mainly, I wish that Rob didn’t feel so bad about how the marathon went, because I think he did a really great job. I’m hoping that in a few days (after the quad pain subsides), he realizes what he actually accomplished and starts to feel better about it. Because really, all of this will make a great story to tell Fig someday. Congrats to you and Fig on a great first race! CONGRATULATIONS ON A RACE WELL RUN!!! I would say you and FIG did a wonderful job at the race, after your LONG winter!!!!! Another chapter to add to the BOOK you will write for FIG!!!!! And, just FYI- I did NOT drive a MINI VAN, NOR EVER< EVER???? have BAD HAIR, and CERTAINLY could have put MANY MANY "I HAVE AN HONOR ROLL STUDENT" BUMPER STICKER on my 'car' -- but didn't-- so, you can choose how you approach this NEW and wonderful role of motherhood!!!!!! You will do it with ALL the GUSTO you've got and be fantastic!!!! and I'll be right behind you' all the way. ( trying not to shove) Take care and stay hydrated!!! luv you, foxymama ( PS) , YOU LOOK FANTASTIC IN THE PHOTOS!!!!!! esp. for someone who has been SOOOOO SICK!!!! Well, you probably have no idea that I actually read your blog, but I do via The Gutz. Just wanted to say congrats. While I am nowhere near the runner you are or ever will be, I can relate as I watched friends (who I convinced run this race) as well as Chicago last year when I was pregnant and supposed to be running. I guess sometimes there are plans out there for us that we don't have control over--little babies and injuries! Congratulations to all 3 of you for a GREAT FINISH!!! ... if you only knew the joy that is about to come your way!! Anytime you feel that "first tangible incident in which you lose yourself forever" is about to happen, call me...I was proudest when I was that mini-van driving mom-bus with bad hair and a “my kid is on the honor roll” bumper sticker, it was those times that I was at my best-- (scratch the bumper sticker part). You'll never lose yourself, you will only get better! Sorry I was part of the traffic jam, keeping you from seeing Rob!! I finished in 4:42 and saw a lot of biking women trying to cross... maybe it was you! A well-organized marathon, though, much to be proud of. Good luck in the rest of your pregnancy! I don't expect you'll be in a mini-van either...so don't worry about that!! My daughter-in-law had an unplanned pregnancy,didn't really know if she wanted a family. Also felt that her life ( not anyone else's) was going to change 'A LOT'. Now, she has a baby boy that is the hi-lite of her life. She says all the time, "cannot believe I was thinking my life would never be the same. It is more wonderful now than I could have ever imagined." Good luck, and your life will be whatever you make of it.